Children are still eating too much salt, putting them at risk of developing serious health problems in later life, data suggests. Research by Consensus Action on Salt and Health (Cash) reveals that some family-friendly restaurants are serving up children's meals with high levels of salt, possibly giving young diners a taste for unhealthy food. The charity, which surveyed 218 children's meals from 23 restaurants, warns of a new generation of salt addicts. Small amounts of salt are essential for good health. Too much salt, however, can have the opposite effect. 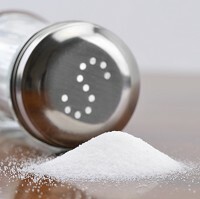 Salt can lead to raised blood pressure, which causes strokes, heart failure and heart attacks, while there is increasing evidence to suggest it can also lead to stomach cancer, osteoporosis, obesity, kidney stones, kidney disease and vascular dementia. Patients with health conditions can take out medical travel insurance when jetting off abroad on holiday. It can cover the cost of medical bills if they fall ill, giving them peace of mind to enjoy a trip away. The maximum salt intake recommendation for a whole day for a one to three year-old is two grams, yet more than a quarter of the children's meals (28%) surveyed contained two grams or more of salt. Three quarters of the meals (74%) contained a third or more of the maximum daily recommended intake of salt - three grams or half a teaspoon - for a child aged four to six. Cash nutritionist Sonia Pombo says it is a scandal that so few restaurants are taking salt reduction seriously. She claims the targets set by the Department of Health offer a perfect opportunity for restaurants to show their commitment to the health of their customers, particularly younger ones, and dietary habits in childhood are known to influence eating patterns later in life. Five of the 23 establishments surveyed - Jamie's Italian, Subway, Bella Italia, Eat and JD Wetherspoon - have pledged to reduce salt in their meals by signing up to targets set by the Department of Health.